Time and use continue to validate the importance of this classic. This 1966 reference book is a compilation of some of the most important plasma physics measurements published during the late 50s and 60s. Over 300 pages of hard to find information essential to using or understanding gaseous conduction and breakdown. It offers a wealth of useful information on elastic-collision and charge-transfer cross sections, mobility and diffusion, electron attachment and detachment, and recombination. 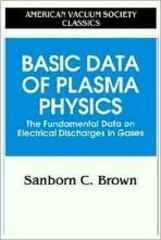 Numerous fundamental principles make this a much-consulted handbook on the physical phenomena, measurements, and properties of plasma physics.